Summer is well underway and the temperatures continue to rise. One of the easiest ways to remain energized throughout the sweltering months ahead is to remain fully hydrated throughout the day. However, so many find themselves tired of the plain old glass of water. Rather than rely on the single slice of lemon, or worse… sugary sodas and fruit drinks, why not try delicious infused water recipes? Not only do they provide a tasty way to intake the recommended eight 8-ounce glasses of water per day, but they are easy to make and ultra-refreshing. Stock up on the ingredients you’ll need for these DIY flavored waters during your next trip down the produce department of your local Foodtown supermarket. 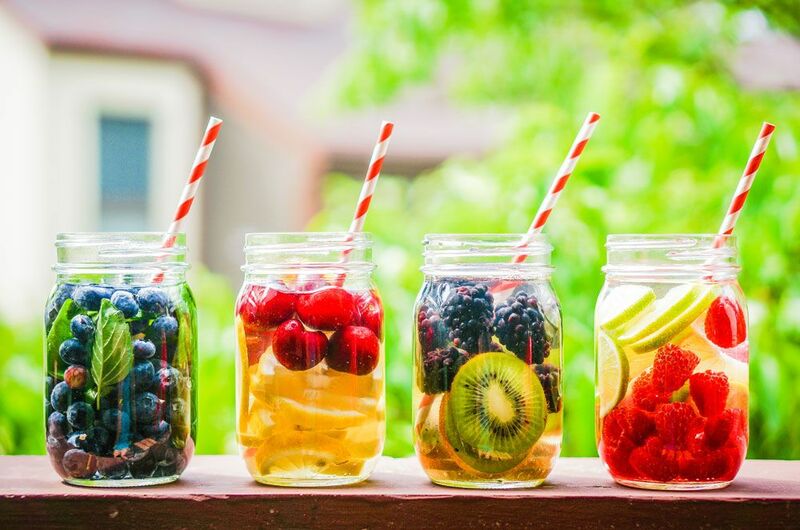 Infused water is an easy and affordable way to stay hydrated and happy this summer—all you’ll need are water and your choice of flavorings. While there is no wrong or right way to infuse water, here’s a basic recipe to follow, as well as some fruit, vegetable, and herb ideas to get you started. Slice the fruit and/or vegetables into bite-sized pieces and place at the bottom of your pitcher, along with herbs, if using. Slightly mash fruits, vegetables, and herbs until juices are released. Fill the pitcher with water and refrigerator for at least one hour to allow flavors to infuse. Fruit is one of the most common additions to water and almost any juicy fruit will do. As you browse our Produce Department’s fruit selection, consider: apples, blackberries, cantaloupe, cherries, grapefruit, honeydew, kiwi, lemons, limes, oranges, peaches, pineapple, raspberries, strawberries, and watermelon. Fresh vegetables can be added to water along with fruit, or they can be used on their own. Pick up some of the following during your next grocery store visit: beets, bell pepper, celery, cucumber, fennel, and jalapenos. Both fresh herbs and dried spices add a bright pop of flavor, perfect on their own or added with produce. Take a trip through our produce and pantry departments to find: cardamom, cinnamon sticks, ginger root, fresh basil, mint, rosemary, and vanilla beans. Staying hydrated this summer is easier than ever with a little help from Foodtown. During your next visit, take advantage of the affordable prices on the fruits, vegetables, herbs, and spices you’ll need to create these tasty and refreshing infused water recipes. Happy sipping! Locate a Foodtown grocery store near you to stock up on the ingredients you’ll need for these hydrating infused water recipes. Be sure to check out our Weekly Circular for ongoing savings! Akin to your own personal shopper, Foodtown On the Go allows you to shop online for your favorite grocery store products and brands. Depending on your location, you may opt for in-store pickup or home grocery delivery—some stores even offer same-day options!